National Chairman of All Progressives Congress, Comrade Adams Oshiomhole has thrown ridiculous banter at the Presidential Candidate of Peoples Democratic Party, Alhaji Atiku Abubakar, saying the ex-Vice President “will sell underwear, if you are not careful”, citing the sale of Nigerian Airways as then Vice President, against perceived reservation as classical example. 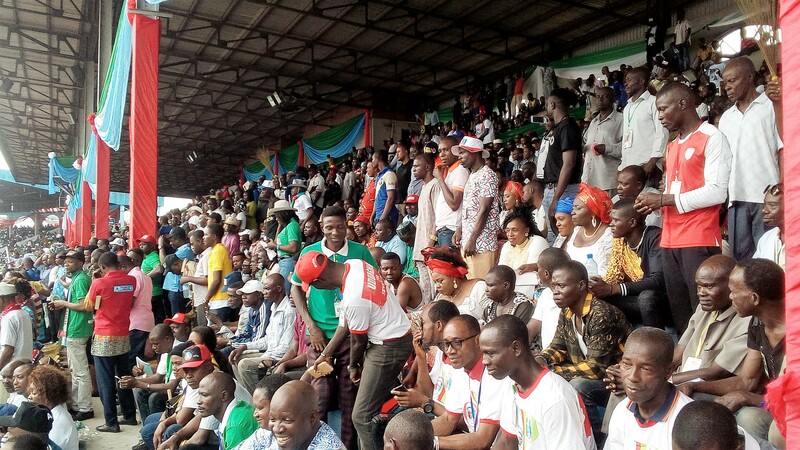 The former Edo State Governor who spoke at the Warri City Stadium during APC Gubernatorial Campaign Flag off in Warri, Thursday January 17, in reaction to promise by Alhaji Atiku Abubakar to sell NNPC if elected President, stressed that he and immediate past governor, of Delta State, Dr. Emmanuel Uduaghan spoke against divesting part of PHCN assets to BEDC, but the Jonathan administration went ahead to effect the privatization. 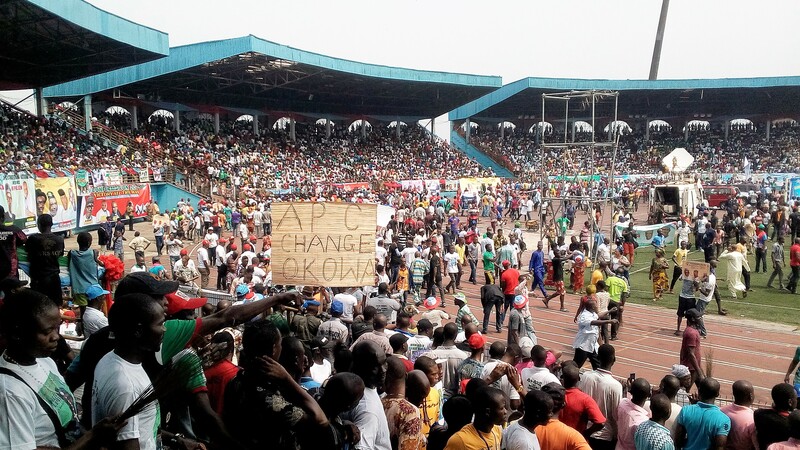 The APC National Chairman while noting that the Olu of Warri, Ogiame Ikenwoli told President Muhammadu Buhari at his palace earlier in the day that the Buhari administration has lived up to his campaign promises in his domain as reflected in the ongoing dredging of Escravos Bar and Warri River, declared, “Okowa must go, Ogboru must come”. He said PDP “took 16 billion dollars and Nigeria remains in darkness and signed 20 years agreement which is difficult to reverse”. Nigeria’s President and Presidential Candidate of All Progressives Congress, Muhammadu Buhari, assured that the interest of his party and his administration “is to save Nigeria, live together and work for our Nation”. While insisting that the APC campaign mandate of 2015 are still relevant ahead of the forthcoming elections and next political dispensation, President Buhari averred that he will not abuse the trust given to him by Nigerians in the fight against corruption, just as he pledged that development of the Niger Delta will be taken seriously. 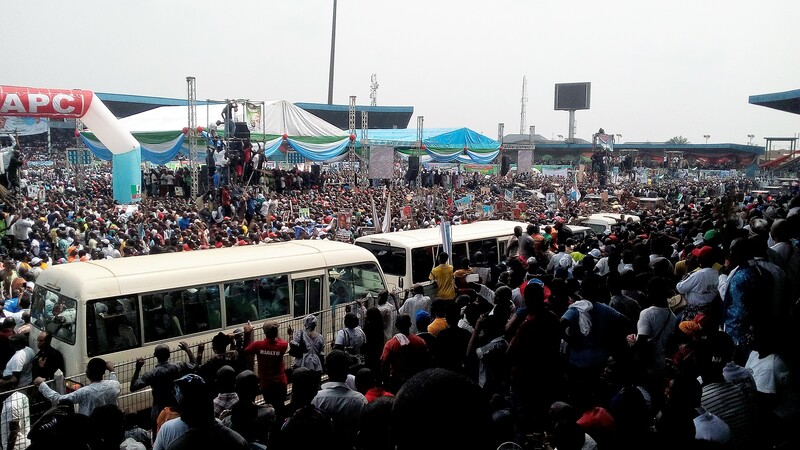 Former Akwa-Ibom State Governor and ex Senate Minority Leader, Godswill Akpabio, Senator Ovie Omo-Agege, Minister of Transport, Rotimi Chibuike Amaechi, Dr. Emmnuel Uduaghan, Delta State APC Governorship Candidate, Chief Great Ovedje Ogboru, Delta State APC Chairman, Prophet Jones Erue and former Delta State Commissioner of Education, Dr. Veronica Ogbuagu, were among Chieftains of the APC that addressed the overflowing crowd that thronged Warri City Stadium for the campaign flag off.